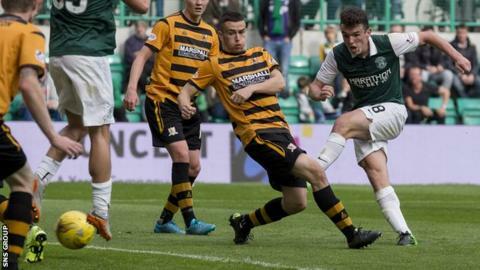 Liam Henderson and John McGinn scored their first Hibernian goals as Alloa were brushed aside at Easter Road. Henderson followed up after a Jason Cummings shot was saved as half-time approached in a one-sided contest. Cummings finished well from a David Gray pass early in the second half to help the Edinburgh side move up to third in the Championship. And McGinn completed the scoring, picking up a short corner before drilling in a low strike. Match ends, Hibernian 3, Alloa Athletic 0. Second Half ends, Hibernian 3, Alloa Athletic 0. Corner, Hibernian. Conceded by David Crawford. Attempt saved. Marvyn Bartley (Hibernian) right footed shot from outside the box is saved in the centre of the goal. Attempt missed. Dominique Malonga (Hibernian) left footed shot from the left side of the six yard box is close, but misses to the left. Corner, Hibernian. Conceded by Robbie Crawford. Attempt missed. Dougie Hill (Alloa Athletic) right footed shot from the right side of the six yard box is close, but misses to the left. Corner, Alloa Athletic. Conceded by Paul Hanlon. Attempt missed. David Gray (Hibernian) right footed shot from the left side of the six yard box is close, but misses to the left. Attempt saved. Dominique Malonga (Hibernian) left footed shot from the centre of the box is saved in the centre of the goal. Corner, Hibernian. Conceded by Colin Hamilton. Corner, Hibernian. Conceded by Kyle McAusland. Foul by Connor McManus (Alloa Athletic). Substitution, Alloa Athletic. Iain Flannigan replaces Burton O'Brien. Substitution, Alloa Athletic. Edward Ferns replaces Graeme Holmes. Substitution, Hibernian. Islam Feruz replaces Liam Henderson. Corner, Hibernian. Conceded by Dougie Hill. Attempt saved. John McGinn (Hibernian) right footed shot from outside the box is saved in the bottom left corner. Substitution, Hibernian. Martin Boyle replaces James Keatings because of an injury. Goal! Hibernian 3, Alloa Athletic 0. John McGinn (Hibernian) left footed shot from the centre of the box to the bottom left corner. Assisted by Liam Henderson. Corner, Hibernian. Conceded by Burton O'Brien. Substitution, Alloa Athletic. Michael Duffy replaces Steven Hetherington. Attempt missed. Liam Henderson (Hibernian) right footed shot from the left side of the box is close, but misses to the right. Attempt saved. Lewis Stevenson (Hibernian) right footed shot from the centre of the box is saved in the bottom left corner. Colin Hamilton (Alloa Athletic) wins a free kick on the right wing. Attempt missed. James Keatings (Hibernian) left footed shot from outside the box is close, but misses to the right.